Is The Booming Natural Gas Industry Overproducing? Hydraulic fracturing, or fracking, was once a small part of the natural gas industry. Then the technology improved and the production rush started. Now, there's so much gas on the market that the prices are at a 10-year low and producers are scaling back. Is The Booming Natural Gas Industry Overproducing? The practice of hydraulic fracturing — pumping fluid into underground rock to push up natural gas — has its detractors, especially among environmentalists. But it's becoming clear that whatever its drawbacks, "fracking," as it's called, is producing a lot of gas — maybe too much gas. Fracking was once a small part of the natural gas industry, a technique to get hard-to-reach deposits in underground shale. Then the technology improved, and the dinner bell rang. Everybody wanted in. Now there's so much gas on the market that the price is at a 10-year low. Michael Kehs, vice president of Chesapeake Energy, one of the biggest shale gas producers, says "the boom has only occurred over the last few years, and the market at first wasn't sure that it was real." But now, he says, "it is so real that's it's actually depressing prices, and the view is that the price will remain low for a number of years going forward." In fact, companies are storing a lot of gas instead of selling it. Underground and tank storage sites are near capacity. Chesapeake is pulling back from some wells. The company is moving half the drilling rigs it uses for dry gas wells into wells that produce both wet and dry gas. "Dry" gas is the stuff you use in your stove or water heater; "wet" gas is ethylene, propylene and butadiene, chemicals mostly used to make plastic or textiles. Wet gas products bring a higher price. Some of these wells also produce oil, which is also pricey right now. It's almost like the shale 'Field of Dreams.' We've built it, and now the demand will come. 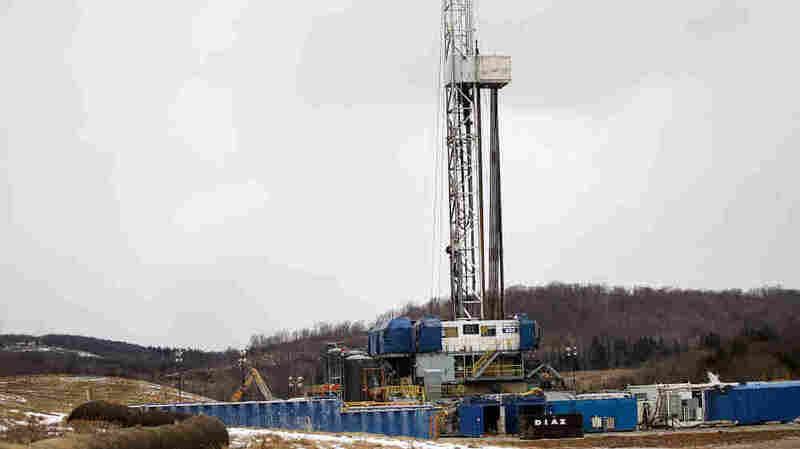 Sara Banaszak, an economist with America's Natural Gas Alliance, an industry trade group, says other energy companies are doing the same, but they aren't likely to abandon shale gas. "Companies that are here to produce natural gas are here for the long term," she says. "You know, there are micro-adjustments in the path along the way, but I think they've made their investments and I think they're going to pursue that path." Banaszak says fracking operations are pretty flexible. "One thing that is good about a lot of the unconventional production is the ability to sort of scale it up and down with changes in demand and supply," she says. For Chesapeake's Kehs, it's a matter of waiting for more people — electric utilities or factories — to move to gas power. "You know," he says, "it's almost like the shale Field of Dreams. We've built it, and now the demand will come." A warm winter has also kept prices down, but analysts at the federal Energy Information Administration say low prices could last for years, which could eventually boost demand. If it doesn't, there's already talk in the industry about liquefying America's surplus gas and exporting it overseas.